Anuschka® "like no other" leather bags, wallets and accessories are made in India, designed by the Basu Family who have been designing and manufacturing leather accessories since 1984. The entire family is involved from design, to manufacture, to distribution and customer service. 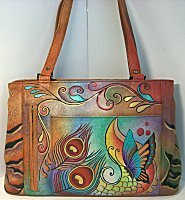 Every Anuschka bag is made from soft cow leather, individually handpainted (no spray painting), so no two are ever identical. The beautiful handbag shapes are full of functional features, while the paintings use colors and designs that are instantly appealing, all of which makes an accessory that will last past many seasons. Measures 10 x 8 x 4 inches in yummy soft pebble textured leather in rich dark pewter gray. The handpainted motif is of dahlia flower in pinks and white. This bag is packed with organization in a compact size! The back has small open slit cell phone pocket, and zipper pocket. From the top, you have front and back full zipper compartments. Between them is a center-snap closure compartment with a zipped pocket, and 3 open pockets. All interior spaces are lined in signature purple fabric, with leather trim on the pockets. Key-finder strap attached to the inside. The bag can be snapped closed on the sides to cinch into a flatter style, but unsnapped when you have to load it with more personal items! Long 3/4 inch strap can adjust for shoulder or cross-body wearing, it also can be detached for storage. Yummy soft handpainted leather wallet, measures 7-1/2 x 4 inches. The background is a rich dark pewter gray, with front flap painting of dahlia flower in pink and silvery-white. One section of wallet has full flap closure with single snap to cover a single compartment for bills or papers, and a full zipper pocket with access on top. The other section closes with a flap and 2-snap closure (for full or not-so-full closing), opening up to 2 ID window slots and 12 credit card slots, 2 long open slots for bills and paperwork, plus another zipper pocket. Sized and shape for work, shopping, and everyday life. Measures 17 x 11-1/2 x 5-1/2 inches, the flat rectangular base has 4 antiqued brass feet. The yummy soft pebble texture leather is handpainted front and back. The birds in green, blue, gold and purple sit on brown branches, flowers explode onto the light gray and tan background, with berry, pink, emerald, gold, purple, and white colors. On the back is cell phone slot pocket and zipper pocket. Inset full zipper top. Interior lined in signature burgundy fabric, has large zipper pocket and 2 open pockets. Comes with signature fabric eyeglass case and cosmetic pouch. The dual straps are 22 inches long and comfy 7/8 inch wide, they do not adjust in length, but have antiqued bronze ring hardware accents. Handpainted leather wallet with soft pebble texture measures 7-1/4 x 4 x 1 inch when folded closed. Closes on one of 2 snaps, depending on contents. On the outside is gusseted zipper coin pocket. Open the front flap, and there is a bill slot, ID window and 5 card slots. Open the other flap to reveal the center compartment, that has full bill slot and 6 card slots. The final section has gusseting to hold the most bills/receipts, divided into 2 compartments with a zip pocket, and yet one more zip pocket on the outside, as well as a smaller receipts slot. Tested with a REAL WOMAN's items...20 plastic card/IDs, 20 $ bills, 20 receipts/business card, 25 coins, and it closed with room for more! Painting depicts a pair of white/silver doves in Christmas holly on silver snow-covered rail with green/purple background. Interior solid dark purple. Sized and shape for work, shopping, and everyday life. Measures 14-1/4 x 9-1/4 x 4-1/2 inches, the flat rectangular base has brass stud feet for protection. The yummy soft pebble texture leather is handpainted on background of deep violet and lilac. The motif of various flowers offers additional colors in rose redinto-pink, amethyst, emerald green, gold and silver. Front corners are solid violet color leather with studs and grommets in antiqued brass. The back offers a zipper pocket. Bag has two main roomy compartments with full inset zip-top closures. One compartment has 2 open cell phone/key pockets. The other compartment zipper and large open pocket, key finder strap. All lined in signature purple fabric. Dual shoulder straps at comfy 15/16 inch flat solid leather. 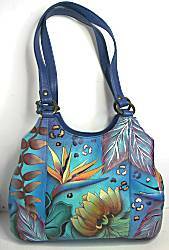 Versatile larger shaped bag, 10-1/2 x 4-1/2 inches at flat base that has pewter color peg legs. It rises 10 inches tall at the center, then 11 inches on side, 16 inches across the full curved zipper top. As the yummy soft pebble leather works with personal items inside, the clever construction will let the top sides cinch inward for "squared" body shape, or flatten for "flared" body shape. Keep it unzipped, and you have a super roomy tote, or zip it up for security. The shape is also affected by the use of the deep side pockets, a zipper pocket and cell phone slot on the back. Comfy 15/16 inch flat leather shoulder strap is 28 inches long. The background is handpainted in pewter gray and violet, the flowers and butterflies add colors of rose pink, green, gold, blue. Interior lined in signature burgundy fabric, zipper pocket on side wall and 2 open pockets on other wall. Key finder strap. This bag comes with BONUS coin purse! 5 x 3 x 1 inch, curved dual-zip top (from either side), signature lining. 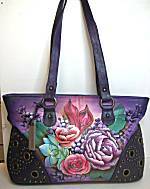 Handpainted in the same motif and colors. Handpainted leather in soft pebble texture, fashioned into slender wallet that measures 7-1/2 x 4 x 3/4 inches when closed. Closes with interior snap. On the outside is a gusseted zipper coin pocket. Inside, there are 2 full bill slots on one side. On the other, there is a full gusseted bill/receipt pocket, long slot for more paper, ID window and 10 card slots that are cleverly staggered for easy access and viewing! Tested with a REAL WOMAN's items...20 plastic card/IDs, 20 $ bills, 20 receipts/business card, 25 coins, and it closed with room for more. Of course, the more items, the less slender this looks! Background is deep pewter gray into violet dusk, with flowers and butterfly painting of deep rose pink, violet, blue, green, burgundy and gold. Measures 10 x 8 x 4 inches in yummy soft pebble textured leather. The handpainted motif has background in denim blues, depicting lilies in deep blues, violet and lilac amid leaves of emerald green, deep rose and gold. This bag is packed with organization in a compact size! The back has small open slit cell phone pocket, and zipper pocket. From the top, you have front and back full zipper compartments. Between them is a center-snap closure compartment with a zipped pocket, and 3 open pockets. All interior spaces are lined in signature purple fabric, with leather trim on the pockets. Key-finder strap attached to the inside. The bag can be snapped closed on the sides to cinch into a flatter style, but unsnapped when you have to load it with more personal items! Long 3/4 inch strap can adjust for shoulder or cross-body wearing. 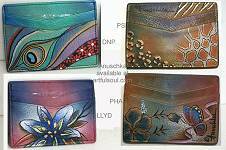 Handpainted leather in soft pebble texture, measures 7 x 4-1/4 inches when closed. Pointed flap has single snap closure. Inside is full zip pocket, with paper money open compartment behind it, and 6 card slots plus ID window slot on top. The other half of open wallet has removable checkbook cover with 7 card slots on top, slots inside to hold checkbook and register. Inside is handpainted in denim blues and pinks. Outside, that also features a zipper coin pocket on the back, is lilies motif in blue, violet and lilac, leaves of bright emerald and rose pink into red, gold, on a denim blue and rose background. Bag measures 11 x 7-1/2 x 3 inches. Soft leather on base, back and front corners is a solid satin bronze. Back has cell phone slot pocket and vertical zip pocket that is about 5 inches deep. 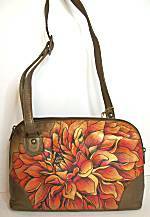 Front is handpainted in rich orange, gold, rose pink, black dahlia motif. Zipper closure runs from bottom of each side, dual zips for versatile access. Interior lined in signature burgundy fabric, and the magic happens in there! Divided into 4 open compartments. The 3 dividers include two open slot pockets, and a full zip pocket. Walls of interior bag include a small zipper pocket, and 2 open cell phone/key pockets. Shoulder strap is comfy flat 5/8 inch wide, adjusts with antiqued brass slider hardware from high shoulder to cross-body lengths! Measures 10 x 8 x 4 inches in yummy soft pebble textured leather. The handpainted motif has background in greens and yellows, depicting flowers on the back with orange and mauve, a pair of peacocks on the front in blue, teal and purple amid the same flowers as the back. This bag is packed with organization in a compact size! The back has small open slit cell phone pocket, and zipper pocket. From the top, you have front and back full zipper compartments. Between them is a center-snap closure compartment with a zipped pocket, and 3 open pockets. All interior spaces are lined in signature purple fabric, with leather trim on the pockets. Key-finder strap attached to the inside. The bag can be snapped closed on the sides to cinch into a flatter style, but unsnapped when you have to load it with more personal items! Long 3/4 inch strap can adjust for shoulder or cross-body wearing, it also can be detached for storage. Handpainted leather in soft pebble texture, fashioned into compartments wallet that measures 7 x 3-/12 x 3/4 inches when closed. The motif is a myriad of flowers front and back, in colors gold, silver, copper, blue, purple, green on a gold and turquoise green background. There is a center full zipper pocket, with snaps on each side that close the other 2 compartments around it. Both compartments have ID windows and 10 scalloped card slots for easy access. One has 2 bill slots, the other has a single bill/receipt slot. One side is open for larger paperwork. Handpainted soft pebble texture leather is sewn into a trifold checkbook/wallet. Measures 7 x 4 x 1 inch when closed, closes with 2 snaps depending on amount of contents. On the outside is a gusseted zipper coin pocket. Open the flap for ID window and 5 card slots, plus full bill slot. Open the next flap to see center section, where there is a full zip compartment, bill compartment, another ID window and 7 card slots, plus a pen holder. On the final section is removable checkbook cover, that has ID window and 5 card slots on its outside, and two full horizontal slots to hold checks and register. If your checkbook happens to have the binding on the narrow side, there is a slot in the wallet for that. Tested with a REAL WOMAN's items...20 plastic card/IDs, 20 $ bills, 20 receipts/business card, 25 coins, checks and register. Gets a little bulky, but it snaps closed easily! Painting depicts mermaid, featuring colors of turquoise blue, green, pink, pearl, red. Sized and shape for work, shopping, and everyday life. Measures 15 x 10 x 4 inches, the flat rectangular base does not have feet. 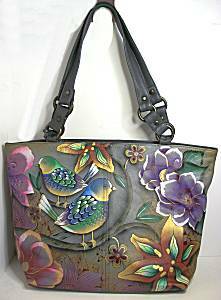 The yummy soft pebble texture leather is handpainted on background of saddle tan, the butterfly, peacock and animal safari motif colors are bright red, yellow, purple, teal green, gold, and black. On the back is cell phone slot pocket and zipper pocket. On the front is open pocket with magnetic snap closure, and another zipper pocket that extends horizontally full length. This bag is divided into 2 compartments with separate top zipper access. Each is lined in Anuschka signature burgundy fabric. One section has 2 open pockets and a zipper pocket with ID panel. The other section has a zipper and open pocket. Comes with signature fabric eyeglass case and coin purse. The dual straps are 24 inches long and comfy 7/8 inch wide, they do not adjust in length. Painting depicts flowers and butterfly, featuring colors of red, green, gold, blue and pink. Painting depicts flowers and butterfly, featuring colors of lavender, pink, red, green, orange, yellow, gold. Painting depicts butterflies in flight, featuring colors of turquoise blue, green, pink, gold, red, orange and purple. Painting depicts flower and peacock feather, featuring colors of turquoise blue, green, pink, lavender, gold. Painting depicts flower and peacock feather, featuring colors of blue, green, gold, red, gold, silver. 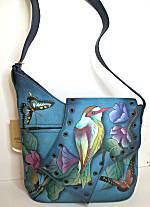 4 x 3 inches, this soft handpainted leather accessory is decorated on both sides. Both sides also have 2 easy-access card slots, and then there is a slot between front and back. 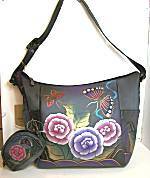 Soft leather handpainted in vivid designs on both sides, formed into 3-1/2 x 2-1/2 x 1 inch coin purse with zip top. Signature black lining. If your hand painted Anuschka® bag requires cleaning, use a slightly damp cloth to clean, avoid chemicals or cleaning solutions.